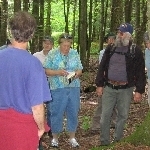 (HOST) Recently, commentator Vic Henningsen was reminded that every walk with an older relative or neighbor is also an opportunity to learn. (HENNINGSEN) Nathan Pero, a member of the Abenaki Nation’s Deer Tribe, has lived most of his long life on land now conserved by the town of Thetford. On a recent sunny morning he joined neighbors to walk and talk about the natural and human history of the territory he knows so well. NP: "This has always been a beaver pond; there’s always been beavers here. And we’ve always been able to catch horn pout out of here. We always had a food supply right next door." NP: "Put ’em out, let the sun cure ’em. Two days later go out, roll ’em over, let the sun bake the other side." Looking far back, he talked of Abenaki life. NP: "When we were in this area different things would come… different crops would come at a certain time of year. We’d travel from forest to forest to forest." Here’s how the Abenaki used pumpkins to cook. NP: "They took their stone knife, cut the top, pull out the seeds. Some of the seeds you ate, some you kept for next year’s crop. Put in the corn, put in the beans, put water in and then all the fires that they had, they had round stones that were kept on the outside edge – boiling stones. Pick that stone up, put it inside the water, put the cover on and leave it. And then, in three, four, five hours come back and take the top off, take out the stones, and there’s your entire meal." There’s a quiet pride to Nathan’s commentary. Abenaki were stewards of the land, not its possessors, and now, some three centuries after whites settled in Thetford, this land is once again held in trust for those who will come later. NP: "Native Americans have given the white people a civilization, lots of things. "We didn’t write the history down," Nathan lamented at one point on our walk. But it seems to me that the long human and natural past of our neighborhoods haven’t disappeared. Their secrets are in front of us, hiding in plain sight, waiting to be found. But they yield only to those, like Nathan, who travel slowly, observe closely, and think about what they see. "You’ll go through your whole life learning things," he said to the youngest member of our group, "Then, when you get to be my age, you learn even more." NP: "There’s a lot of land here, and every time I walk it I always see something new. I was out here on snowshoes, and it’s so peaceful and quiet in the wintertime. When we get to the top there’s going to be a big area and it’s all moss on top of the ledge and don’t go towards Strafford. It goes down over, but you can see all the way up to the big village, right through Strafford valley…"